Is It Normal for My Baby to Cry While Asleep? 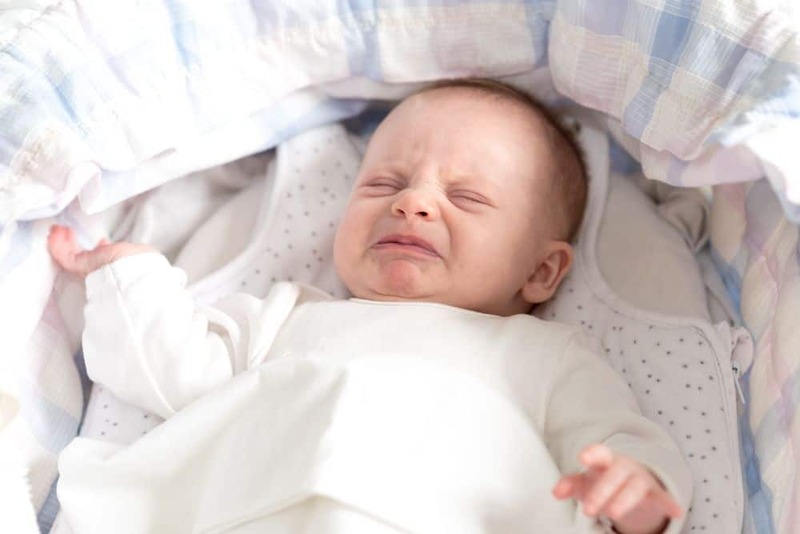 My Baby Is Crying in Their Sleep — What Should I Do? Is your baby crying in the middle of the night but when you check, they’re still asleep? Are you wondering whether this is normal and whether or not you should wake them? It’s something many new parents might experience, but how do you deal with a baby crying in their sleep? The first few times this happened to me I had no clue whether my little one was in pain, needed a diaper change, needed comforting, or was hungry. As I got used to the different cries, I realized that none of these things applied. Even when sound asleep, my baby was crying like a banshee. So what do you do when this happens? Let’s look at why babies might cry in their sleep and what we parents should do. Why Do Babies Cry and Move in Their Sleep? Can I Do Anything to Prevent Restless Sleep? What Should I Do When My Baby Cries in Their Sleep? Can My Baby Have Nightmares? To better understand why your little treasure might be crying in their sleep, it helps to know how the sleep patterns of newborns work. Figuring this out can help you decide how to soothe your baby when they scream and cry but aren’t awake. You will have noticed that your baby sleeps for most of the day and night, waking every few hours for a feed. For you, as a new parent, it might seem they don’t sleep at all. You seem to be constantly responding to their demands. Babies don’t follow a set sleep schedule. My baby certainly didn’t — day or night, it made no difference, we were still woken up every hour or so. Each baby is different and will have their own sleep and feeding routine (source). Most babies don’t sleep for more than a few hours during the night until they’re approaching three months old. For some who weigh a bit more, maybe between 12 and 13 pounds, this could happen earlier. For some unlucky parents, their baby might not establish a regular sleep pattern until they’re over a year old (source). I hear you praying that you are one of the luckier ones. But understand that it’s not done to deprive you of sleep; their little tummies just can’t hold a lot of food and they get hungry. Once a regular sleeping pattern is established and your baby’s diet changes, they can start sleeping six to eight hours a night (source). So your baby has been fed, has a clean diaper, but still starts crying in their sleep. They may also look like they’re fighting off an unseen foe. Let’s look at the sleep stages they go through, to shed some light on why this might happen. Just like adults, babies experience different stages and depths of sleep. These are periods of quiet, active, and transitional sleep, as well as being awake (source). During this time, your baby’s eyelids will be closed and you’ll see little or no movement of their eyes behind them. They’ll be breathing normally and will lie still with no movement. You might hear the occasional gentle sigh, indicating that they’re content in their little world. This is when you might see rapid eye movements behind baby’s eyelids. They may cry and their arms and legs can twitch, or they might jump like they have been startled. In the blink of an eye, the crying can stop and your baby might frown, smile, or make other facial expressions. Other things that happen during this stage are sucking noises and gentle snorts. Your baby’s breathing might appear irregular. In between quiet and active sleep, there is a transitional sleep period and, likewise, between active and quiet. Their eyes might open and close and they could be crying or whimpering. In between these different stages, there are times when baby might be awake but will go back to sleep unaided. They could be crying during this stage as well, even when there is nothing wrong. Babies also have two different types of sleep, REM and non-REM sleep. REM, or rapid eye movement, sleep usually happens when the baby is in a light sleep. During this sleep, babies dream. About 50 percent of baby’s sleep is spent in the REM state; even more when they’re newborn. Babies can be restless during this stage and again might whimper or cry. When a baby is in non-REM sleep, their eyes won’t move behind their lids. There are four stages to this sleep. Stage one: Baby will be dozing or drowsy and their eyes may be droopy, closed, or open. Stage two: This is a light sleep where a little one can easily be startled by sounds and movement. Stage three: Baby enters a deep sleep and doesn’t move much, although they might make some noises. Stage four: Baby enters very deep sleep, doesn’t move, and remains quiet. These different stages will happen several times throughout their sleep. There will be quiet times and times when they thrash around and make a noise or cry. Babies set their sleep patterns in the womb. By the time they’re born, you might already have an idea of when they’re going to be awake. You may have felt the times of day or night when they practice their dance moves the most. Once they enter the world, it can take a few months for them to establish their sleep patterns. There are some reasons why your baby might be restless, which can lead to them crying in their sleep. Your baby’s nervous system is still developing and controlling their reflexes and movements can be hard. This results in them kicking, twitching, and punching out when they’re asleep. They might also cry for no reason. We have mentioned sleep patterns and cycles in some detail above. These are often the main reasons your little one appears to be taking part in a WWE fight in their sleep. Babies will regularly change from little angels to Tasmanian devils while they sleep. They will wriggle, kick out, scream, and cry, as they pass through the different stages of sleep. Taking long naps during the day can be counterproductive to your baby getting a good night’s sleep. They might not settle easily and find it harder to fall into a deep sleep. This can mean kicking, tossing and turning, and crying. As nice as it might be for you to kick back while they nap in the day, remember this could keep you awake more during the night. Too little sleep for your baby can be just as bad as too much. Your baby will become irritable and overtired. This can cause them to be fussy and have difficulty sleeping. An irritable baby will find it difficult to settle into quiet sleep time. They could be fractious and cry out in their sleep. Now you know some of the reasons why your baby may be restless at night, you might wonder if there’s anything you can do. Here are some things that might help (source). Follow the same routine each night. This can teach your baby to recognize the difference between day and night, and help them establish sleeping patterns that are more similar to your own. There are a few ways you can do this. Try feeding your baby, then giving them a warm bath, and soothing them to sleep. You might be tempted to rock them to sleep when you’re breastfeeding, but this is not a good idea. They can learn to associate it with bedtime and expect it, thereby not learning to fall asleep on their own. When they become sleepy, lay them down. This way, they will still be awake but drift off to sleep on their own. Wrapping your baby so they’re cozy and warm before placing them in the crib might give them a feeling of security. If swaddling is not your thing (I never mastered it), try a baby sleeping bag. Playing some soothing lullabies or music, or even singing to your baby, can help them sleep better. Part of establishing a regular sleep pattern is helping your baby associate the light with daytime and darkness with night. During the day, keep baby exposed to natural light and then keep their nursery dark at night (source). Babies are more likely to be active and unsettled at night if they’re uncomfortable. It’s their way of letting you know something’s not quite right. They might not wake up while they’re doing this and could be crying while asleep. Maybe they’re too hot or too cold. Their clothes could be irritating them. You will generally know the cries which indicate that they’re hungry, thirsty or in need of a clean diaper. It’s only natural when you hear your baby crying to want to wake them up for a cuddle to soothe them. Nevertheless, when they cry and are still asleep, waiting and watching what happens can be the better option. They could just be fussing as they move through the phases of deep and light sleep, and not actually ready to wake up. The chances are they’ll stop crying and go back into a deeper sleep within a few minutes. If they need a diaper change, are hungry or thirsty, or something else is wrong, they will likely continue to cry, and wake themselves up. That’s your cue to leap to action and attend to their needs. Keep these nighttime feeds and diaper changes calm and quiet. Do what you have to do with the minimum amount of light and sound, so baby learns to recognize it’s sleep time and not play time. It can sometimes be difficult to work out whether your baby is awake or asleep when they cry at night. Their eyes might flutter or be open and unrecognizing, almost like they are semi-conscious. This is why a wait-and-watch approach is a good idea. If you have a baby monitor with a screen and night vision, then you might not even need to go into the nursery. While you’ll be awake, they won’t, and they may settle back down without intervention. Although there’s much debate on the subject, it seems that until a little one is about a year old, they don’t have nightmares. What they might experience is referred to as night terrors. These affect about 3 percent of children, and again, they tend to be toddlers or older (source). It is thought these happen during the first few hours of sleep. Your little one might scream, cry, and be inconsolable. The next thing you know, they’re sound asleep again. The only one with any lasting after effects is you. If these happen, you can gently reassure your child with your voice, and calmly hold their hand until they settle. Hearing your baby crying in sleep is likely much more distressing for you than it is for them. Most of the time, there’s no cause for worry and baby will return to peaceful sleep quite quickly. If you feel at any time there is cause for worry, then speak to your pediatric doctor. They will reassure you and let you know whether there’s any reason for concern. The chances are that, once your baby’s sleep patterns become more regular, they will cry less and make fewer noises at night when they’re asleep. In the meantime, when they cry, just watch and wait, and soothe them if they really need it. We hope you enjoyed our insights into why your baby might be crying in their sleep, and that you found it useful. Please leave us a comment with your thoughts and experiences. If you know other moms who could benefit, please don’t forget to share.